Funding to support the Northern Beaches Council’s development of a masterplan for the West Esplanade Precinct in Manly, including a feasibility study for reinstating the boardwalk and harbour pool, has been provided by the NSW Government, Member for Manly James Griffin announced today. The project is one of 33 projects across NSW – two in total for Manly – that will share in $2.67 million in grants to provide for the upgrade, expansion, restoration or conservation of locally listed heritage items in towns and suburbs across NSW. The funding is provided through the Heritage Near Me Activation Grants which target heritage items that are accessible to the public. “I congratulate Council on their outstanding submission and am delighted to assist them with a $100,000 grant so they can develop their masterplan for the West Esplanade Precinct,” Mr Griffin said. The masterplan will also seek to rejuvenate the Art Gallery façade on West Esplanade to showcase Manly’s history and heritage. “I acknowledge the crucial role played by the Northern Beaches Council in managing our local heritage assets and I congratulate Deputy Mayor Candy Bingham who has championed this issue for many years. Northern Beaches Council Deputy Mayor Candy Bingham welcomed the funding for the masterplan. "The harbour pool and boardwalk was an icon of Manly until it was destroyed by storms in 1974, and is fondly remembered by those of us who are old enough,” Cr Bingham said. Nearly $25,000 has also been provided to the Northern Beaches Council to improve physical and digital access to the historic Manly Cemetery, which includes replacing out-dated cemetery database records and maps with an online search including interactive digital mapping cross referenced to digital images of cemetery monuments for each grave site. This year marks the third round of Heritage Near Me Activation Grants. Over the three years, a total of $8 million has been awarded to support 107 local heritage projects across the state. To find out how recipients of previous Heritage Near Me Activation Grant rounds have been protecting, sharing, and celebrating their unique local heritage, go to www.environment.nsw.gov.au/heritage-heroes. To read more about the Heritage Near Me program go to www.environment.nsw.gov.au/heritage-near-me. 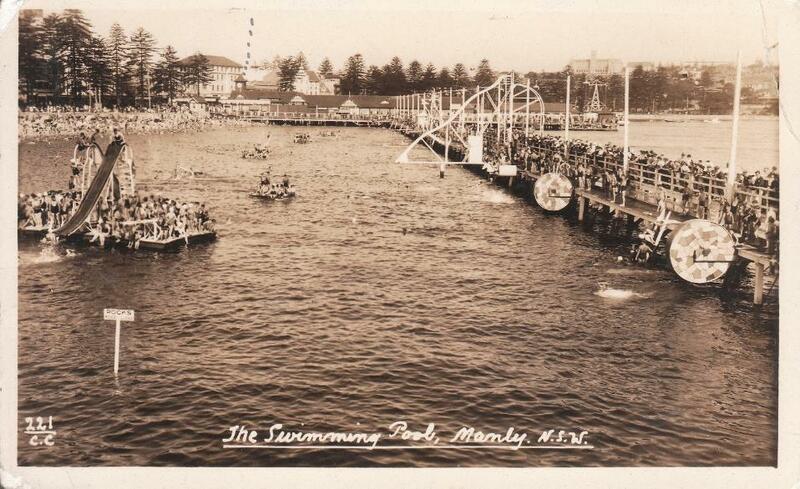 There have been a few schemes and shark-proof pools at Manly over the long long years. A few highlights prior to the 19974 'Sygna Storm' that destroyed the version spoken about above. PROPOSED PIER FOR OCEAN BEACH, MANLY. 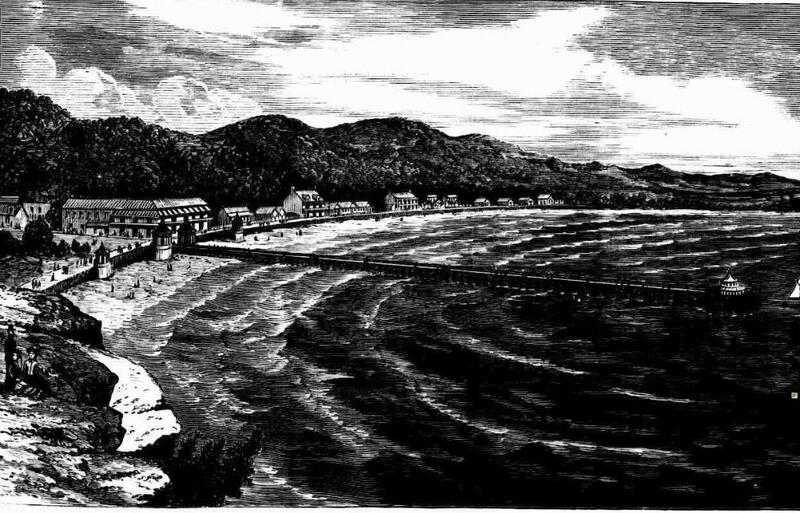 THE engraving on page 21 shews a design for a proposed Iron Promenade Pier for the Ocean Beach, Manly or Brighton ; this suggestion is made by Mr. F. A. Franklin, OE., as a practical, profitable and simple means of providing further for the recreation of the fast increasing number of visitors to this popular place of resort. 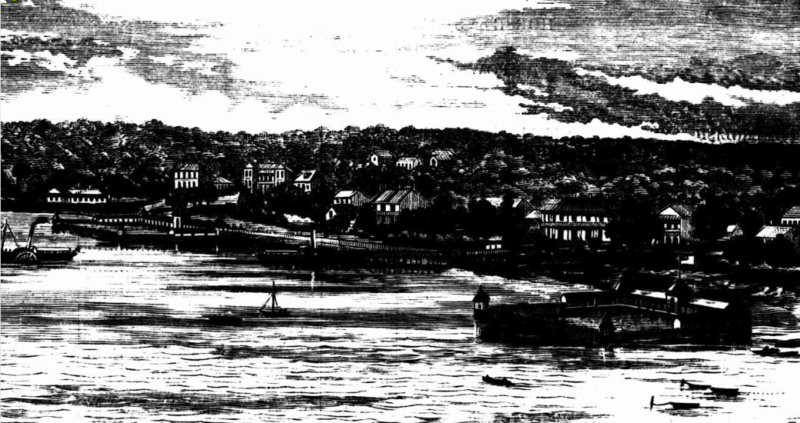 And considering the comparative small cost of such an undertaking, with the expense of forming a permanent sea wall and esplanade of the same extent along the beach, there can be but little doubt in the minds of those acquainted with the subject, the scheme is worth the consideration of capitalists and those interested in Manly. The pier shewn is about 1,000 feet in length extending beyond the broken water, is composed of iron through-out, the piles being of wrought-iron, having all submerged parts protected from the action of sea water, and resting on cast-iron screws 4 feet in diameter ; the piles would be secured longitudinally and. transversely with light iron bracing, reaching from low water level to underside of deck. The outer end of Pier being octagonal in form, gives a diameter of 150 feet, and a height of deck 20 feet above high water level ; from the small resisting surf ace of piles and bracing, the force of waves in ,the most severe easterly weather would have but little or no effect on the structure. The octagonal end of the pier would be provided with a comodious pavilion of handsome design, capable of accommodating a large number of persons, havingrefreshment and waiting rooms, band-stand, hot and cold baths, and all the latest improvements adopted by modern experience on the piers of the English and Continental watering places. The ascertained annual number of visitors to Manly is 156,000, and it is estimated fully 70 per*cent, of these would use the pier, paying a small toll, which. together with the established system' in England of yearly and quarterly subscriptions from residents and visitors would produce a large interest on the cost of the pier besides paying for up-keep and salary of pier-master. PROPOSED NEW BATHS, INNER BEACH, MANLY. Manly Beach, circa 189? - from Picturesque New South Wales / Kerry & Co., Photo., Sydney. Digital Order Number: a5091010, courtesy State Library of NSW - Notye the 'shark proof' swimming pool! Above is the same image, broader, cleaner, as taken from the Jubilee Souvenir of the Municipality of Manly 1877 -1927 - courtesy Scott Lea, Old Sydney Album page on Facebook. The Manly Municipal Council has before it a proposal, which was submitted by the Port Jackson and Manly Steamship Co, Ltd, for an enclosed shark-proof bathing pool and pier promenade at West Esplanade The plan pro-vides for an extension of the existing steamer pier in a northerly direction to a point near Fairlight Pool. On the pier, It is suggested, will be a refreshment kiosk, and from It will depend the shark-proof net. The pier will be about 12 feet wide. A picture of the pro-posed structure appears on page 12. The new Manly shark-proof pool, to which admission is free, was used by big crowds of holiday makers yesterday and today. TO-DAY - TO-MORROW - SUNDAY. 14 miles of unrivalled Harbour views-Across Sydney's Famous Heads-Surflng on the Cleanest Beach on the Coast-Picnicking under the cool, shady trees at Fairy Bower-Rock Pool Bathing for Kiddies. PORTION OF MANLY'S SHARK-PROOF ENCLOSURE-AN AREA 850 ft. LONG X 230 FT. WIDE IS NOW AVAILABLE FOR PADDLERS AND SWIMMERS ON THE CLEANEST, BRIGHTEST, AND BEST BEACH IN PORT. JACKSON. MANLY BAND PLAYS ON OCEAN BEACH ON ALL HOLIDAY AFTERNOONS AND EVENINGS. TO-DAY (New Year's Day) commencing 11.30 a.m., GRAND SURF CARNIVAL, ALUMNI CLUB, AT MONA VALE. A TEAM COMPRISING AUSTRALIA'S 8 CHAMPION SURF BOARD MEN, GIVE A THRILLING DISPLAY. Dancing on the Pier this afternoon and evening. Steam Trains for Kiddles, Miniature Golf. Steamers for MANLY BEACH leave No. 3 Jetty, Circular Quay, every 15 minutes. FARES: ADULTS, 6d. CHILDREN, ONE PENNY.